These townhouse style apartments are a perfect style and space to make the transition to city living. 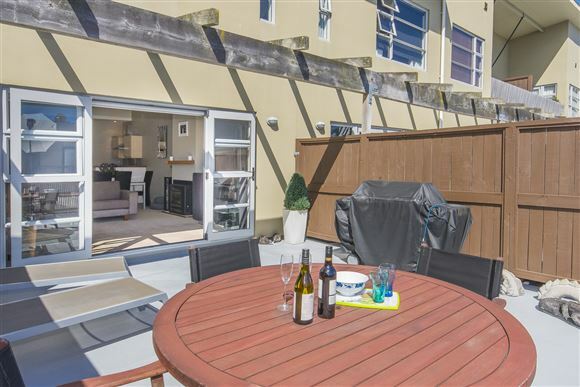 Spacious decks at both sides of the apartment giving morning and evening sunny living. There are three spacious bedrooms plus three bathrooms, allowing for separate personal spaces. Great for rental also for flatmates to have a sense of privacy. A second lounge or office space allows for family areas to be separate, teenagers still at home or working from home. The spaces are completely flexible, set over two levels. Garaging, storage and with Moore Wilsons just outside your door, no more driving to super market. If I have your attention, then 2015 could bring you a change and a city dwelling that is just perfect.